I’m not a musky kind of girl when it comes to perfume. I really like the fresh and floral scents. It takes me a really long time to commit to a scent and because of this I can go AGES before I actually buy a full sized bottle. For the past year, I’ve been happily living off the samples I’ve received from both my Glossy Box and Birchbox subscriptions. But I figured it was about time to get a scent of my own. A while ago, my husband bought me a scent from Crabtree and Evelyn and I loved it. So, I decided to go back and see what they had in stock. After a few sprays, I decided that Wisteria was coming home with me. It smells so fun and clean. I really REALLY like it. What are your favorite perfumes?? Would love to hear your recommendations! I like light floral scents as well. My daughter has allergies so I avoid “overpowering” perfumes. I guess one should be doing that anyway… I love Chloe Eau de Parfum. 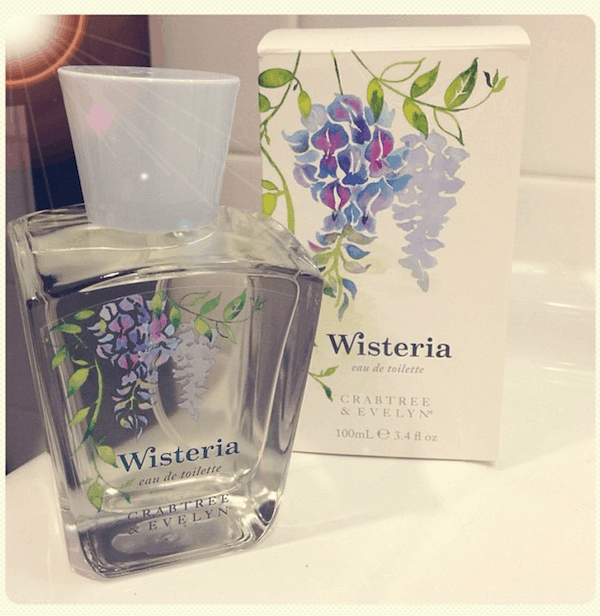 I’ll definitely have to try Crabtree and Evelyn’s Wisteria, sounds fabulous! Thanks for the perfume tip!